Asian-spiced turkey lettuce wraps. The post holiday, delicious, quick and easy meal that will help you squeeze back into your skinny jeans. After last weeks sugar explosion here at Pass the Sushi and my smorgasbord of ham and mac and cheese yesterday, I felt like I owe it to my self (and my cholesterol level) to try to make something healthy. Shock and awe from anyone who knows me, I know. 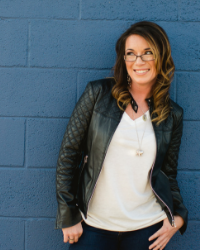 But really, we were a little on the wild and crazy side, so now its time to make nice with those new pair of jeans – just in time for warmer weather. Cuz Lord knows that bikini is out of the question. 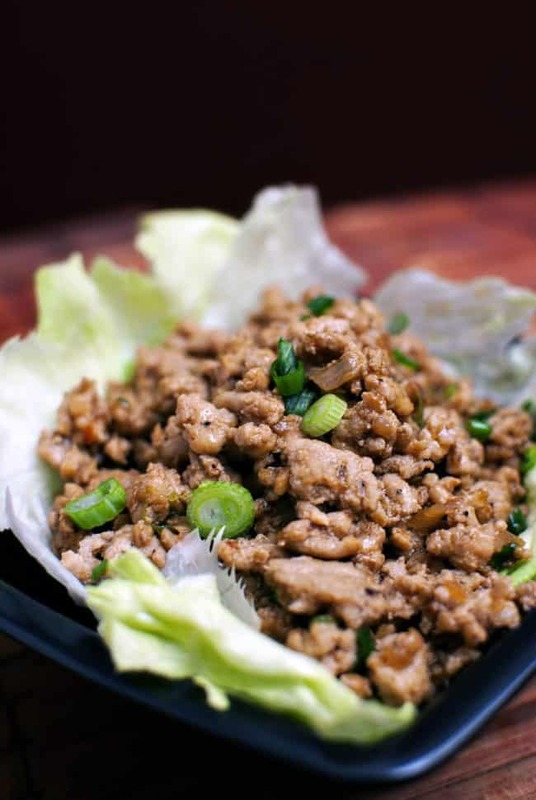 I saw these Asian-spiced turkey lettuce wraps on The Novice Chef and knew I had to try them. I wanted to serve these with rice, just to break things up a little, but for the two of us and our head of lettuce, this was enough; no rice needed. In a large wok or non stick skillet, heat oil over medium heat. Add the garlic and shallot and cook for 15 seconds, then add ground turkey. Break up the meat with a spoon, tossing/stirring often, until meat is cooked through. Once the turkey is cooked through, check and see if there is a lot of grease left over in the bottom of the pan. If there is, drain the meat, and then re-add to the wok. If not, skip to the next step. Add the scallions, lemongrass, rice vinegar, hoisin sauce, soy sauce, and garlic chili sauce. Toss well to ensure everything is coated. Allow to cook for another 2-3 minutes and remove from heat and sprinkle with cilantro. To serve, separate leaves of lettuce and wash with warm water; pat dry. Spoon the turkey mixture into the center of a lettuce leaf and eat like a taco! I’m lucky to have an Asian market right behind my storefront, where I get things like lemongrass and hoisin sauce. If you don’t have a specialty market near you, don’t worry. I’ve seen a lot of growth of the Asian food aisles at normal grocery stores, and even in big box stores. The prices are a bit more then what I pay where I go, but it works in a pinch. One of my favorite dinners ever! Glad you enjoyed them! Your photo looks great! I sometimes have a hard time finding butter lettuce too. It is all about balance:-) These may be healthy but they also look delicious! I have such a weakness for lettuce wraps. If I see it on a menu, it’s as good as ordered! Thanks for the recipe, I might just have to try these! Yum. I love lettuce wraps and order them out a lot, but never think to make them at home. Love the addition of lemongrass in these. They look fab. You have no idea how much I want to reach into the screen right now and devour those! 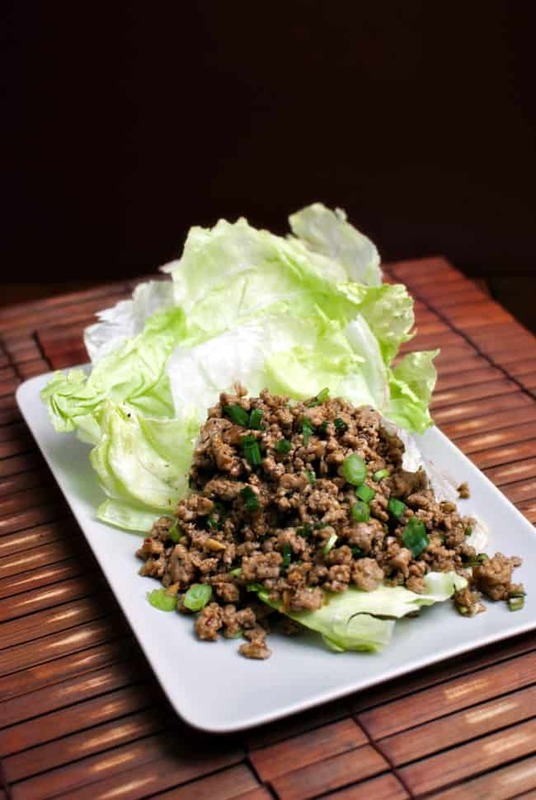 Holy cow do those look good….I have always been a fan of lettuce wraps but yours look SO tasty! I might have to eat these for the next three days 🙂 They look fantastic! 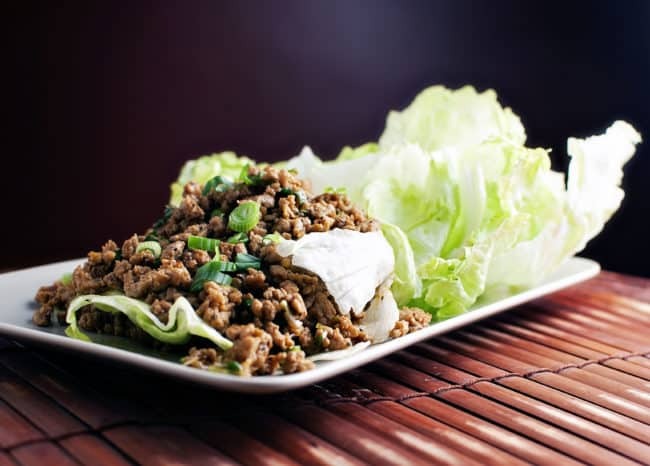 love lettuce wraps, crunchy bundles of goodness with no guilt! I love these. So filling yet healthy and not too heavy. Definitely time for the skinny jeans! Shall pass a link your way when I post the menu up Monday morning. I love to wrap my burgers in iceburg lettuce so I can just imagine how delicious and juicy-fresh this is! This may end up on my Facebook page sometime in the near future! This is a good summer meal. Low carbs and filling. Thanks for sharing it.